Hello and welcome to my Cerebus Fangirl Page! Cerebus the Aardvark is the story of one life written and drawn by Dave Sim with backgrounds by Gerhard. Started in 1977 and completed in 2004, the total page count is approximately 6,000 pages. All of it was published by Dave's publishing company Aardvark-Vanaheim. If you are just now finding out about Cerebus, you can go here to get more info. Check out the Update Bulletin to see what is new on this site and what is new with Cerebus. For the more recent links that I haven't had time to add to the links page, check out my Del.icio.us page from which you can get an RSS feed of the daily link updates. There is also a CFG Forum where you can go to discuss the latest and greatest news about Cerebus and other topics of interest. 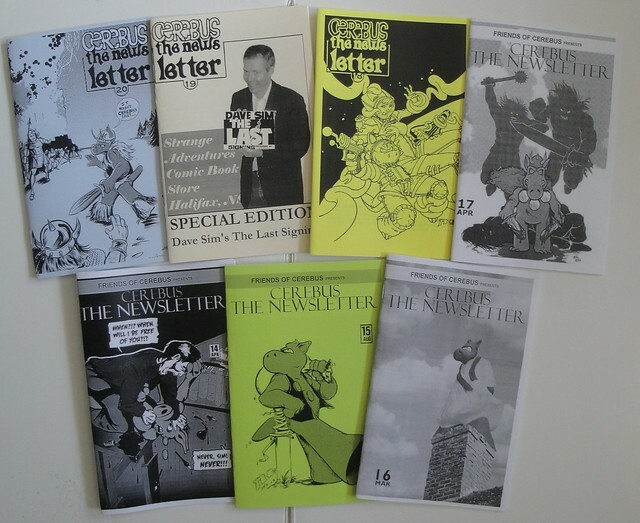 The Return of Cerebus the Newsletter! Currently I'm reprinting the out of print issues, but you can still take a look at the Friends of Cerebus site. Home Page: Back to this page. More Info: Find out more information about what Cerebus the comic book is about. Artists' Info: Bios for both Sim & Gerhard, the Dave Sim Memorial Notes From the President Archive, many interviews and essays by Dave & more Cerebus Creator info. Cerebus Checklist: Every Dave Sim, Gerhard and Cerebus item I could find is listed here and most have pictures. Misc Stuff: Anything not covered in the other sections, from Five Bar Gate to Back-up Stories. Links: Over 100 Dave Sim, Gerhard and Cerebus related links. Pictures: Lots of pictures and some wallpaper for your computer. To see what is on each of those links, use the Site Map or if you are looking for a specific term, use the google search function below which will just search this site. Go here to buy Cerebus. Cerebus is copyright 2011 by Dave Sim. So, hands off, dude. Here are some frequently asked questions. I want to Thank many people who have helped this site grow and improve. Thanks! For the curious -- the background picture is originally from the cover to Cerebus No. 157. If you can't see it on the right there, it just means your monitor is smaller then 1680 resolution.